Professor Vladimir Hachinski is the worlds leading doctor with specialization in stroke and vascular dementia. He has made major contributions for the fight against these two greatest threats to human brain. His contributions to medicine in the areas of vascular cognitive impairment, stroke, and brain-heart interactions help save and improve million of lives by delaying and/or preventing cerebrovascular disease and cognitive decline. Professor Hachinski, along with John W. Norris, established Maclachlan Stroke Unit, Canadas first acute stroke unit. The Unit proved to be the most effective way to treat stroke patients of all ages, severities and types. Professor Hachinski also coined the term brain attack to create the sense of emergency for stroke and stroke warning symptoms. The term is used globally, and hence helps urge patients who would otherwise have ignored their symptoms to get to hospital in time for disability sparing treatment. The practices initiated by Professor Hachinski were so successful that they have now become the standard of healthcare worldwide. Apart from that, Professor Hachinski also took lead in the proclamation of World Stroke Day (Oct 29th) in order to raise public awareness on stroke prevention and early treatment. Professor Hachinski is the neuroscientist beyond the discovery of the relationship between brain insula and cardiac complications, which helps explain the cause of sudden death following acute stroke. He coined the term multi-infarct dementia and leuko-araiosis, and introduced the Hachinski Ischemic Scale, one of the most widely used clinical tools for the distinguishment between degenerative dementia (e.g. Alzheimer disease and senile dementia) and multi-infarct dementia. 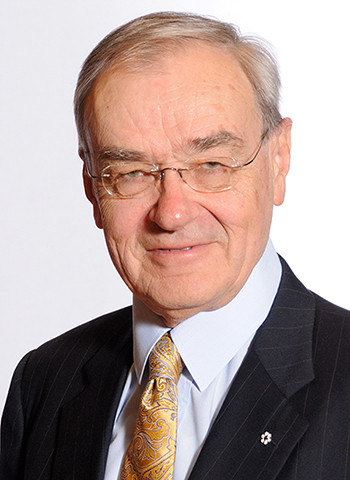 Professor Hachinski was President of the World Federation of Neurology (WFN) from 2010-2013. As President, he attached high importance to stroke and Alzheimers disease since both together accounted for 2/3 of the disability-adjusted life years (DALY) lost due to brain diseases. Professor Hachinski is accomplishment in the identification and treatment of the vascular causes and factors in mental diseases offers promising ways to prevent vascular cognitive impairment and to delay dementia (e.g. Alzheimers disease), which has resulted in countless more individuals surviving from the diseases worldwide.